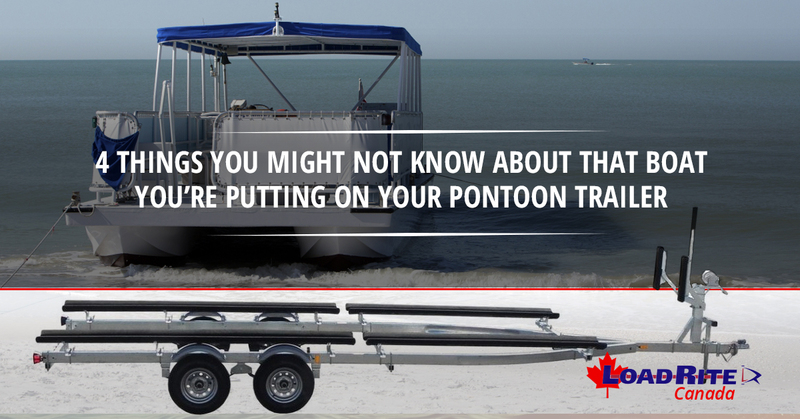 While many people are stopping by our Monkland or Innisfil boat trailer yards looking for traditional boat trailer, some are looking for a boat trailer that’s specifically made for one special type boat: pontoon boats. These boats might not be able to get around quite a quickly as a speedboat, but they certainly serve their purpose as fishing and pleasure boats. Few boats have as many uses, so we’re always happy to see someone coming in for a pontoon trailer. But if you own a pontoon trailer, you’re probably more interested in what you can do with it than in finding out some fun facts. But you’re already here, so read on! The idea of rafts has been around for thousands of years, but there’s only so much weight you can add to a raft before it sinks under its own weight. In 195 2, Ambrose Weeres thought that the idea of a wooden raft could be improved if air were used as the primary buoyancy provider. He welded a bunch of steel barrels end-to-end, making two airtight columns. Wouldn’t you know it, it floated just fine! He started selling some of them in his home state of Minnesota, which made a lot of sense considering how many lakes it has. The idea took off, and he was eventually crowned Mr. Pontoon. When most people think of houseboats, they imagine the standard vessels that we see on the lakes or being pulled by a pontoon boat trailer on our Ontario streets. But pontoon boats are amazingly diverse. They are used as river ferries, and catamarans are technically pontoon boats. They don’t even have to be motorized: a rope and human muscle can pull them from one place to another, or a motorized boat can pull a pontoon raft. Whether or not you use a pontoon on the ocean depends on the boat itself. The construction of the boat is important, as some have been designed to work better on the ocean. Some have been designed to better hold up against the pontoon effect, which is when a wave hits a pontoon boat laterally and causes it to flip. When you look at the basic shape of most boats, they form a downward wedge that goes underwater. This is always the first point to hit in shallow waters, even if the sides of the boat are safe. With pontoon boats, the air inside the pontoons keeps the body of the boat well above such shallow water areas, often out of the water. Come See Our Pontoon Boat Trailers Today! If you have a pontoon boat and are looking for the best boat trailer for it, we look forward to seeing you here at LoadRite Canada. Our boat trailers can handle from 2,500 pounds all the way up to 5,000 with no problem, so we’re sure we can find the right one for you!